Although there’s a fierce rivalry between smartphone manufacturers, companies are usually on much better terms with their suppliers. But over the past two years, the relationship between Apple and Qualcomm has been anything but amicable. The two companies have been locked in an intense legal fight that pits one of the biggest smartphone sellers in the world, Apple, against one of the biggest designers of smartphone processors and modems, Qualcomm. The two have sued one another across the globe, claiming monopolistic practices, patent infringement, and even theft. At the heart of the conflict is one core question: how much is Qualcomm’s technology worth? Apple claims that Qualcomm has demanded excessive fees to use its modems and patents, while Qualcomm asserts that Apple is using the legal system to try to get a good deal on its technology. It’s a critical question for the entire industry — you can’t make a modern smartphone without coming into contact with Qualcomm’s patents, so the outcome of these lawsuits could have an enormous effect on every company that manufactures phones, as well as Qualcomm’s bottom line. In recent months, the battle has escalated. 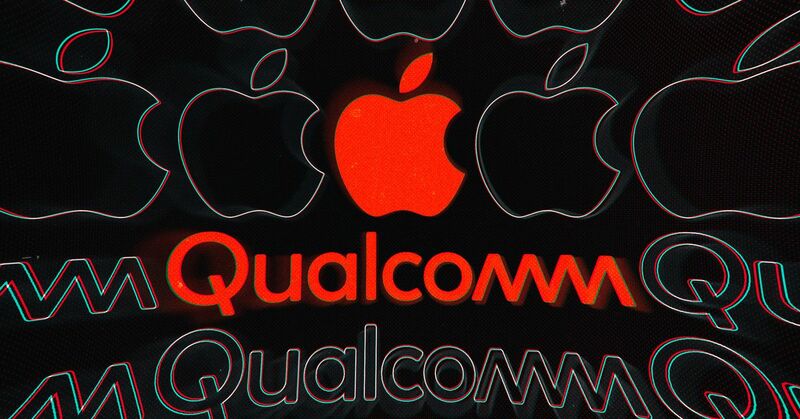 Qualcomm claimed that Apple stole “vast swaths” of its “confidential information and trade secrets,” and it’s chipped away at Apple with small but meaningful court victories, leading to partial iPhone bans in Germany and China. Now, the main event has finally arrived. On Monday, Apple and Qualcomm will face off in San Diego federal court, and Qualcomm will be forced to answer Apple’s accusations that its patent costs are unreasonable and its licensing terms are unfair. If it can’t, then Qualcomm risks losing a chunk of the billions of dollars it currently makes from patent licensing. At its core, Apple’s lawsuit is all about patents, specifically the patents that cover the design and functionality of a phone’s modem. You can’t make a smartphone that doesn’t wirelessly connect to the internet, which means you can’t make a phone without coming into contact with these patents — and a huge number of them are owned by Qualcomm. The way Qualcomm sees it, those patents are a hard won product of billions of dollars of research and development, and it’s reasonable to now rely on them for billions in revenue. When Qualcomm sells its modems, it’s not just selling hardware. It’s also selling a license that’s bound up with that hardware, part of an alleged “no license, no chips” policy. But Apple says that Qualcomm has been able to charge more for these patents than it should have because the company is also the dominant supplier of smartphone modems. If any manufacturer doesn’t agree to the license fees, Qualcomm has the power to cut them off from modems, too. Since Apple made these complaints in its initial court filing against Qualcomm, the fight between the two companies has spiraled into a global showdown. Initially, Apple appeared to have the upper hand. Regulators around the world including in the US, South Korea, Taiwan, the EU, and China have all attempted, with varying levels of success, to fine Qualcomm for similar practices to the ones Apple has complained about. Qualcomm paid $975 million to settle an investigation in China, $853 million for violating antitrust laws in South Korea, and $93 million over an antitrust dispute in Taiwan. More recently, Qualcomm has been chipping away at Apple. The company managed to get judges to agree to ban iPhones in China and Germany, forcing Apple to temporarily pull iPhone 7 and 8 models. In the US, a jury recently agreed that Apple violated three of Qualcomm’s patents. Qualcomm overcharging for its patents is a problem, Apple argues, because you can’t make a modern smartphone without them. They’re essential to industry-wide standards, and should therefore be licensed on what are known as “FRAND” terms (short for “fair, reasonable, and non-discriminatory”). Apple says that Qualcomm has agreed to these terms in filings it’s made to the European Telecommunications Standards Institute (ETSI), but that it doesn’t honor these commitments. The two companies have tussled over these terms for years outside of court, starting when Apple first began using Qualcomm modems in 2011 in the iPhone 4. Beginning with that phone, Apple says that Qualcomm agreed to refund a proportion of Apple’s royalty payments, but only if Apple agreed to exclusively use its modems. Apple claimed that in order to reduce its “exorbitant royalty burden” it had “no choice” but to make this promise. “Qualcomm used unreasonable terms to gain even more unreasonable terms,” Apple said in a court filing. Qualcomm says that these events happened the other way around, and that Apple demanded patent refunds first. In return, Qualcomm says it asked that Apple use its modems exclusively, so that it could guarantee it would sell enough modems for the arrangement to be worthwhile. This arrangement continued until 2016, when Apple says Qualcomm eventually withheld as much as $1 billion in payments. This was the catalyst that led to Apple suing Qualcomm in January 2017. According to Apple, Qualcomm did this because it had testified truthfully to the Korea Fair Trade Commission in South Korea about Qualcomm’s licensing practices. In a preliminary ruling, a judge sided with Apple in this portion of the dispute. Although the agreement between the two companies said that Apple couldn’t attack Qualcomm in court or with regulators, the judge said that Apple’s actions hadn’t given Qualcomm the right to cease the payments, and that it owed Apple as much as $1 billion in unpaid royalties. Apple’s lawsuit over the remittances began the same month the US Federal Trade Commission announced a lawsuit of its own against Qualcomm’s patent practices. That lawsuit, which went to trial in January, is currently pending a judge’s decision. Apple has kept up the pressure on Qualcomm since the legal skirmish began. In 2017, Apple instructed suppliers like Foxconn and Compal to withhold all royalty payments to Qualcomm while the dispute is ongoing. Qualcomm responded by suing Apple’s suppliers, who then decided to join Apple’s fight against the chipmaker. Qualcomm has countersued Apple for telling its suppliers to stop paying, so it can recover additional damages if it wins this case. Qualcomm hasn’t taken Apple’s aggressions lying down. It’s spent the past two years accusing Apple of infringing on its patents, filing complaints in the US, Germany, and China with a certain amount of success. Judges in Germany and China both found that Apple had infringed on some of Qualcomm’s patents and responded by banning the sale of certain iPhones — although Reuters notes that the China ban never appears to have been seriously enforced. Apple has also played its own hand in the patent fight, claiming that Qualcomm infringed on patents relating to power usage. By chipping away with patent wins, Qualcomm hopes to prove that its patent portfolio is as or more valuable than what it’s been charging. This wouldn’t disprove Apple’s allegations — that Qualcomm is inappropriately forcing it to agree to onerous licenses — but it could encourage the company to stand down, if it looks like the legal battle could ultimately cause costs to rise. In a recent trial in San Diego, Qualcomm successfully argued that Apple was infringing on three of its patents to the tune of $1.41 per iPhone. That’s just a small part of the $7.50 Apple pays in total per iPhone for Qualcomm’s patents, but if the courts judge Qualcomm’s other patents to be similarly valuable, then Qualcomm could be emboldened to raise its prices further still, passing a hefty bill on to Apple. Qualcomm has also hit back with claims that Apple stole the company’s confidential modem tech and gave it to its fierce rival Intel. According to Qualcomm, Apple stole “vast swaths of Qualcomm’s confidential information and trade secrets” and used it to improve Intel’s chips. Qualcomm is currently in the process of suing Apple separately over these claims. In a recent court case with the FTC, Qualcomm also argued that Apple’s ability to exclusively use Intel chips proves that there’s still a healthy amount of competition in the industry. Apple claims that Monday’s case is all about bringing Qualcomm’s monopolistic and anti-competitive practices to an end. Apple wants to be able to buy modem chips from whomever it pleases (or even make its own) without having to factor in large patent royalty payments. The transition from 4G to 5G is a key moment for the mobile industry, and if current trends continue then Qualcomm could end up dominating the industry for the next 10 years. Qualcomm’s fight is somewhat more existential. In 2016, while its licensing deal with Apple was still ongoing, three-quarters of Qualcomm’s profits came from its licensing division. Apple alone delivered roughly $1.7 billion in revenue during the first six months of 2017. If a jury agrees with Apple, then Qualcomm could be forced to reduce the price of its patents, potentially reducing its strongest source of profits. It could also further open the market to competing chipmakers, while making it cheaper to build a phone. An Apple representative also referred us to older comments, in which the company said Qualcomm’s practices are “harming Apple and the entire industry” and that the patent lawsuits against Apple are just attempts to “distract from the larger issues they face” from regulators worldwide. Apple and Qualcomm’s trial is due to finally begin on Monday, starting with jury selection. Over the coming weeks, expect to see lawyers intensely scrutinize executives from two of the biggest tech companies in the world. The revelations and results from this court battle will not just make headlines — they will also affect the smartphone market for years to come.